Energy Conserving Fan Control - Utilizing algorithmic air circulation for optimal temperature levels, our innovative fan control system conserves energy by at least 15% and increases compressor life by up to 30%. efficiency without the risk of refrigerant leakage from corrosion, but also prevents the overflow of condensate water. LED Lighting Interior Display System - Brighter and longer lasting LED lights provide attractive, enhanced illumination compared to fluorescents. It saves energy by producing less heat, while maximizing the visibility in the display area. LED Advertising Panel - LED lighting offers 10 times longer lasting life than fluorescents and conserves energy as well. Efficient Refrigeration System - Turbo Air’s glass door refrigerators are designed with oversized and balanced (CFC Free R-134A) refrigeration systems. These include efficient evaporators and condensers for faster cooling and greater efficiency. Tasteful and Modern Appearance - The design of our products is one of our top priorities. 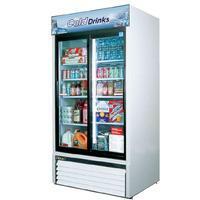 Whether you have a restaurant, bar, convenience store or gas station, Turbo Air refrigerators will compliment the appearance of your operation. Magnetic Door Gaskets - Magnetic door gaskets are of one piece construction, removable without tools for ease of cleaning and replacement. Double Pane Glass Doors with Heat Reflecting Film - Equipped with unique double pane glass doors with a layer of patented, transparent thermal insulating film applied between the two glass layers. Lightweight door construction reduces door maintenance and roller wear, and facilitates smooth door opening. ultimate choice in customer convenience. Bottom Mount Compressor Units - Turbo Air’s bottom mount compressor allows easier access for service and extra storage space above. In addition, the lower area provides a cooler and less greasy operating environment which results in reduced compressor running time.